Falco, Rita, 90, of Absecon, passed away November 20, 2018. She was born in Philadelphia on May 30, 1928, the third of seven children to John Vita and Rose Corrado Vita. She was a resident of Atlantic County since 1960. Rita loved to travel with her family. She especially liked to cruise the Caribbean. Additionally, she made many trips to Tennessee and Florida to visit her daughters. Rita was one of the original employees of Caesars Casino from which she retired at the age of 70. 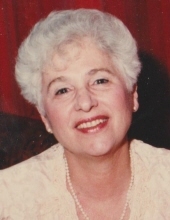 Rita was predeceased by her husband, Joseph Falco and grandchildren, Ronald J. Ardente and Randi Lyn Ardente. She is survived by her four children, Rosemary Ardente (Ronald) of Cape Coral, FL, Patricia Steinmann (Thomas) of Nashville, TN, John Falco (Mina) of Egg Harbor Township, NJ and Thomas Falco of Absecon, NJ. She is also survived by her grandchildren, Regina Ardente Budd (Marshall) of Egg Harbor Township, Gina Leiphart (Dan) of York, PA, Dominic Falco of Egg Harbor Township and Juliana Steinmann of Nashville, TN; as well as 3 great-granddaughters, Cristin, Courtney and Lucia; and her two great-grandsons, Marshall and Vincent; her siblings, Pauline O’Donnell of Indianapolis, IN, Katherine Grisafi of Philadelphia, PA, and Frank Vita of Collingswood, NJ; Countless nieces and nephews survive her, as well. The family would like to express thanks to Spring Village at Galloway and Grace Hospice for their excellent care and compassion given to Rita in her final year. Funeral services will be held on Saturday, November 24, 2018 at Parsels Funeral Home, 324 New Jersey Ave., Absecon, NJ; where family and friends may view from 9AM until 11AM, with a funeral service to follow. Burial will take place at Laurel Memorial Park in Egg Harbor Township. For online condolences, please visit www.parselsfh.com. To send flowers or a remembrance gift to the family of Rita Falco, please visit our Tribute Store. "Email Address" would like to share the life celebration of Rita Falco. Click on the "link" to go to share a favorite memory or leave a condolence message for the family.